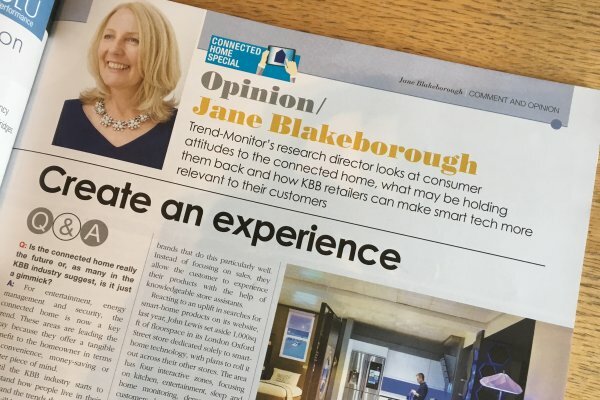 In this month’s kbbreview, our research director Jane Blakeborough is asked about consumer attitudes to the connected home, what may be holding them back and how KBB retailers can make smart tech more relevant to their consumers. Q: Is the connected home really the future, or as many in the KBB industry suggest, is it just a gimmick? A: For entertainment, energy management and security, the connected home is now a key trend. And the reason these areas are leading the way is because they offer a tangible benefit to the home owner in terms of convenience, money-saving or greater piece of mind. Until the KBB industry starts to really understand how people live in their homes and the trends that affect how homes will be used now and in the future, they will struggle to convince consumers that their products offer similar benefits, and smart appliances will continue to be regarded as gimmicky by most homeowners. Trend-Monitor’s recent research into kitchen purchase behaviour found that, although the inclusion of a smart kitchen appliance when purchasing a complete new kitchen had increased significantly over the 3-year research time-frame, this was from a very low base. And 35% of those homeowners who didn’t have any smart kitchen appliances said they didn’t think the technology was relevant for their own kitchen, with a further 23% unaware that the technology was available. Q: How can retailers make the most of the connected-home market and best sell these products? A growing trend within retailing is to create an ‘experience’ for the customer. Apple and Samsung are both technology brands that do this particularly well. Instead of focusing on sales, they allow the customer to experience their products with the help of knowledgeable store assistants. Reacting to an uplift in searches for smart-home products on its website, last year John Lewis set aside 1,000 sq ft of floor space in its London Oxford Street store dedicated solely to smart home technology, with plans to roll this out across their other stores. The area has four interactive zones focusing on kitchen, entertainment, sleep and home monitoring, demonstrating to customers how technology can be used to control their homes through their smart device. Creating this interactive real-home environment helps consumers to understand how smart technology can make their lives by saving time and effort. Q: Isn’t there a lot more to creating a true smart-home concept than just having smart appliances in your kitchen? A: A true smart-home is one which has a holistic and integrated approach, enabling the different devices to communicate with each other, interact instinctively with the homeowner and provide intelligence regarding expenditure and consumption. Until now one of the major barriers to creating a true smart-home was the lack of a secure, standardised operating system for the home which brands can build on. Now companies such as Gideon are entering the market with their ‘smart home in a single app’ concept, allowing all devices to be controlled via one tablet or smart phone. Q: Is it aimed at all sectors or are we still waiting for it to filter down? A: The smart home is still very much in its infancy and currently positioned at the luxury end of the market. Whilst low ownership of these devices is unlikely to change in the next 12 months, interest in the automated home is growing. Growth is likely to come in stages, as different categories take off. Q: Doesn’t the future of the connected home rely on retailers getting on board? A: Most new appliances entering the KBB market are smart-ready with connected features as standard. However the longer replacement cycle of KBB products which means that this market will take some time to catch up with categories such as home entertainment. Retailers can speed up this cycle by providing an ‘experiential’ space with targeted promotions. Q: Where do you see the smart-home evolving in the future? The growth in single person households – how can smart technology ensure that everyone can come home to a warm, lit home and with tea in the oven? The ageing population – How can smart devices enable the ill or elderly to stay in their own homes or in assisted living situations longer, plus provide peace of mind to relatives by enabling them to check in remotely? Multi-generational families – how can homes be zoned to consider the different requirements of each generation living under one roof – lighting and heating levels, shower settings, eating habits etc? The rise of the celebrity chef – Can connecting TV programmes with the contents of the fridge and the online shopping list tap into our national obsession with cookery programmes?